1. How did you create this best travel insurance companies list? 2. "Best Travel Insurance" versus "Cheapest Travel Insurance"
11. What should good travel insurance for winter sports look like? 16. What's the best cheap travel insurance? We’ve combined expert reviews from independent sources to come up with our list. How did you create this best travel insurance companies list? Our research combined the scores from Which?, the consumer magazine, Fairer Finance, an organisation aiming to inform consumers about the quality of the companies they can buy from and Defaqto's travel insurance ratings. Put together, these sources provide a wealth of information on how well the insurers treat their customers. We assigned extra points to the five companies awarded “Recommended Provider” status by Which? Saga Travel Insurance, Direct Line and M&S Travel . We also considered whether the insurer had won any awards. Finally, we excluded travel insurance provided by banks, as these are often only available through a current account package. You can read more about travel insurance from banks below. There were a few providers that were close to being included in our list. They are Flexicover - Platinum Travel Insurance, Aviva multi-trip travel insurance and InsureandGo. "Best Travel Insurance" versus "Cheapest Travel Insurance"
Although price is an important factor for many people, your choice of travel insurance company should never be on price alone. Price comparison websites (such as confused.com) have made it easy to make a good single and annual travel insurance comparison and select the level of baggage, cancellation and medical cover you want. The trouble is that it can be hard to tell how these insurers will behave once they have your cash up front. So, the list in this article goes beyond that by including opinions and ratings on how well these firms have served their customers to date. It’s important to understand what’s really included in your purchase. The headline limits of medical, cancellation and baggage are helpful starting points, but there might be variations in other terms that are harder to spot. It's also worth checking the quality of the company and its customer services; if an extra £5 means you get better service in the event of a medical emergency abroad, then it is money well spent. It's worth insuring your car hire excess separately to save money. Check out the best car hire excess policies. The top rated travel insurance companies in our list offer many of these features. If you're thinking about travelling to an unstable country, you might want to read our guide to travel insurance with terrorism cover and for dangerous areas. People are increasingly worried about terror attacks while on holiday so our guide also reveals which standard travel insurance offers cover for terrorism. The USA is one of the most popular destinations for UK holidaymakers. There’s a huge range of options for tourists, from quick trips to New York to surfing in California, and it helps that Americans speak the same language as us. However, travel insurance costs much more than to other countries, partly because the price of medical treatment is so high in the USA. For example, it costs in the region of £100,000 to be treated for an infection in a Californian hospital with return flights. That means for single and annual multi-trips you usually have to choose worldwide cover including the USA and Canada, rather than choosing them as separate countries. Prices can vary massively between providers for this option so we’ve listed our top uk travel insurance providers to cover you for a trip to the States. This list is based on the price of the premium and quality of cover for each policy. The quotes we got were for a 35-year-old travelling to the USA for two weeks. All the policies in our top 10 have at least £10m of medical cover, at least £3,000 for cancellation or curtailment, at least £1,500 for luggage, at least £200 for the single item limit, an excess of no more than £80. If you’re over 50 or 65 it’s worth looking at Saga or staysure for the best deals on travel insurance and because they may have more competitive prices for those age ranges. All the policies in the list were rated 3, 4 or 5 out of 5 by an independent financial researcher, Defaqto. See our full list of travel insurance for pre-existing medical conditions reviews here. See who the best travel insurance policies for people with medical conditions are. The providers in our regular best travel insurers list made it there by being good providers for the whole of the market - they're generalist firms and reviews indicate they should serve the "average person on the street" well. However, a traveller with pre-existing medical conditions will find that many of these companies refuse to quote, depending on their particular condition and its severity. This is because many firms do not have specialist knowledge to deal with pre-existing medical conditions. As with medical conditions, age has a significant impact on both the cost and availability of holiday insurance. Frustratingly, there is no consistency between travel insurance companies on age limits, making it almost impossible to put forward a "Best List" in the way that we have done above. Go direct to several specialist insurers to check prices. Saga, staysure and Flexicover are good places to start. Consider Single Trip Travel Insurance. While Annual Multi-trip cover works out cheaper for younger travellers, insurance companies' concerns about medical conditions developing or worsening during the course of a policy year usually make annual cover more costly for the over 65s. Buying single trip policies for each trip could save you a lot. Read about the maximum ages for different travel insurers here. Skiing and snowboarding are regarded as higher-risk activities by insurance companies because injuries are not uncommon and it can be expensive to get people down from the mountain and give them treatment. This means insurers often offer winter sports cover as an add-on that costs more or a standalone policy, rather than being included as standard. Most winter sports policies cover skiing and snowboarding and can seem very similar on the surface. But it is important to check they have a high level of medical cover and include all the activities you want to take part in. One area where policies often differ is their definition of off-piste skiing or snowboarding. It may seem like an advanced activity but any part of a slope outside a marked run can be classed as off-piste, so even if you're taking a well-used shortcut between two green runs that could be considered off-piste. Not all insurers will cover off-piste, and ones that do may only cover off-piste skiing within certain boundaries or with an instructor. We believe you should be able to go wherever you want, so our list of the best winter sports policies includes cover for off-piste skiing and snowboarding without an instructor. For more information on skiing off-piste, check out our article. Or join our group for cheaper insurance for off-piste skiers here. Columbus Direct - Off-piste skiing is allowed within the boundaries of the ski resort. Moreover, they have a varied list of activities you can include for an added premium and they offer cover for your ski equipment. Direct Travel - Off-piste skiing is allowed without a guide so long as the authorities or the resort don't advise against it, which is one of the fairer definitions we've seen. However, if you're planning on backcountry skiing, you may want to double check with Direct Travel that it is covered. Direct Travel includes tobogganing and sledging as standard and you can include snowmobiling at an extra cost. Their policy includes £1,000 cover for loss or damage to your own ski equipment. Staysure - Staysure is aimed at over 50s and allows you to ski off piste as long as you're on recognised off-piste areas. There are some limits to the activities they will cover, but for an additional premium you can extend your policy to cover activities such as snowmobiling. Post Office - Off-piste skiing is allowed within resort boundaries. Cover can be extended to skidooing and snowmobiling but these activities do not include personal accident or liability. LV= Allows off-piste skiing within the boundaries of the ski resort. They have a list of activities for which they offer no cover, which includes heliskiing and bobsleighing. On the other hand, they have a relatively low excess of £50. If you're looking for insurance that covers more advanced or adventurous activities like heliskiing, you may want to consider a specialist company or policy. Insurers such as Snowcard, ERV and Dogtag offer cover or adventure packs to cover particular sports or activities. Snowcard allows you to personalise your insurance to fit your needs, which is a useful way of bringing your premium down if, for instance, you don't need baggage cover. What should good travel insurance for winter sports look like? Bear in mind that holiday insurance companies often need you to pay an extra premium to take part in activities that they think are more dangerous, such as skidooing and snowmobiling. Also, you may not have any personal liability cover for these activities. It’s best to check your policy documents and make sure you’re getting covered for everything you need. And what if you arrive at the slopes, and there’s no snow? Some insurers will pay out if you end up not being able to ski because of poor conditions, or even pay to relocate you to somewhere where you can ski. These policies don’t offer as wide a range of extra activities and to ski off-piste you must be with an instructor or qualified guide. However, they all offer at least £10,000,000 in medical expenses cover, £2,000,000 in personal liability cover and snowboarding as standard. See the best backpacker travel insurance companies. Choosing travel Insurance for a backpacking trip or a gap year is more complicated than finding the best insurance for a conventional holiday. Detailed Limits. Many backpacker travel insurance policies have baggage limits that appear high enough to cover the theft or loss of a laptop and/or phone and/or camera. However, cheaper policies have more detailed limits (such as single item, valuables or gadget limits) that prevent such a claim. The best policies give you sufficient cover even at this detailed level - for example, and Flexicover Silver allows you to cover up to £2,000 of gadgets. The Excess. This is the amount you will have to pay yourself if you need to make a claim. The best policy from Top Dog Insurance has a zero excess. Activities Cover. The best backpacker insurance companies cover a wide range of adventure sports as standard. Top Dog Insurance has a list of over 100 that includes bungee jumps and scuba diving. Flexibility. Cheap backpacker insurance policies can prevent you from extending your trip, and regard your trip to have finished completely if you pop back home. By contrast, Alpha Travel Insurance allows unlimited extensions up to a total trip duration of 24 months, provided you contact them in advance. See our Top 10 Backpacking Insurance here. Learn what the best and worst countries to get injured in. Check out the most popular budget backpacker destinations and found that Scotland was a shock favourite. Although it's a UK destination travel insurance can still cover you for cancellations or lost luggage. Most standard travel policies will cover you for a moped with an engine of up to 50cc. Some, like Columbus Direct, will be able to cover motorcycles with engines of up to 125cc as part of their standard activities pack. Post Office travel will even go up to 1500cc. Bear in mind that the personal liability cover will not extend to cover you if you cause an accident. Common exclusions to most standard motorcycling travel policies are racing and riding off-road. You'll need a specialist motorbike travel insurance policy if your motorbike is over 125cc and you're planning on racing or off-roading. You can, however, find policies that will include racing cover. The insurers who do it are normally the ones who will insure powerful bikes. Voyager and Worldwide Insure policies include racing and off-road cover as standard. They also cover bikes of any size motorbike as long as you have a full licence. Voyager will insure your bike for up to 366 days on a single trip and up to 31 days on a multi-trip policy. It is important to consider a motorbike travel policy that offers at least £2m of medical expenses and about £5m if you're travelling to a country like the USA or Canada; cancellation cover; and personal liability cover to pay out in case you cause an accident resulting in damage to public or private property or an injury to a third party. Voyager's Gold policy offers £10m of cover for medical expenses and £2m of personal liability cover. Check out the best motorcyle insurers. Many people wrongly assume that if they have £2,000 of baggage cover on their travel insurance, their Samsung Galaxy S8 or MacBook Air is covered. However, in many cases, the so-called "single item limit" - which can be as little as £150 with some cheap travel insurance policies - means that isn't true. Read the full article on Travel Insurance with High Single Item Limits here. Many banks now provide travel insurance to their current account customers - either as a feature of a paid-for packaged bank account or as a discounted offer. 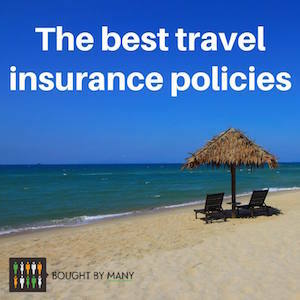 In order to have an "apples-to-apples" comparison between the different travel insurance companies, we excluded banks' travel insurance policies from our "best list". But many of the policies score well in reviews by Which?, Defaqto, and Fairer Finance, so we have listed the best of them here. If you bank with any of these providers, it is certainly worth comparing the policy details to the those of the other companies we've reviewed in this article to see which is the best value. What's the best cheap travel insurance? Bear in mind that cheaper policies tend to have fewer benefits, smaller limits, or higher excess. However, if you're healthy, travel insurance is generally inexpensive. The most important thing it needs to cover is the cost of medical treatment and getting you home if you're injured, and there are plenty of cheap policies that offer this cover. We used a comparison website and got quotes for a 35-year-old woman going to Spain for a week on a single-trip policy. We identified the best cheap policies as the ones that had at least £10m of cover for medical emergencies, less than £100 excess cost under £9 and at least 3 Stars by Defaqto. Having a substantial amount of cover and a low excess means that you'd be able to claim without having to pay a large amount towards the claim, making these policies reasonably priced and good value for money. Remember, always make sure you know exactly what a policy would cover, and how much before you purchase. There's little benefit to an insurance policy that can't protect you in times of need. Travel Insurance won't cover expenses associated with taking your pets abroad - if your dog needs vet treatment while overseas, for example. However, there are several pet insurance policies that cover pet travel - learn more about them in our article about Travel Insurance for Pets to find out how to get the best deal on travel insurance for pets. Most insurers will cover pregnant women but they will have some limits on the cover. Some only offer cover up to 28 or 30 weeks of the pregnancy. Finding this in the small print can be difficult, we looked at a handful of policy documents from our "best list" and could not find any reference to the length of pregnancy. If you are looking for the deal on travel insurance when pregnant it’s best to call or email a provider before you buy to make sure you’re covered. You’ll need to check with the airline if you’re flying because they have their own limits on travel while pregnant. For example, some will not allow you to fly if your pregnancy is considered full term. A lot of travel insurance companies in the UK offer family travel insurance policies. These policies can usually insure two adults and up to five children. The level of cover should be more adequate for an entire family. In addition, if one of you gets sick, you'd be able to use your cancellation cover for the entire party. However, you should be aware that if your child is travelling alone a family travel insurance policy may not cover them so you might need to look into individual cover. And if you have a disabled child you will need to declare any medical conditions to your insurer. Some may not offer cover so you’ll need to look into a specialist provider. It is good to have a European Health Insurance Card (EHIC) for all members of your family, although it should not replace travel insurance because it does not cover costs for things like medical repatriation. Now that the UK has voted for Brexit it is not known what will happen with EHIC in the future.